The day starts reasonably bright and early, accompanied by the sound of Today on BBC Radio 4 (an excellent news source and timekeeper). Most days I walk the short distance to work, but when it’s wintery like today I take the University bus service, arriving at our main campus Library at Kedleston Road in Derby just in time to purchase a newspaper and then head straight into the office. We’re all relatively early starters here, so my day usually begins around 8:30. As LSDD (Library Subscriptions & Document Delivery) Librarian, my work is concentrated around two key areas – finance management and systems administration – both of which occupy my time in equal measure. The first involves oversight of our serial and database subscriptions, co-ordinating the renewals process and monitoring the monthly finance and spend. I work closely with colleagues in our Operations and Finance teams to ensure that our financial position is accurate and consistent throughout the academic year. The second area is the administration of our e-resources, including online serials and databases. Systems administration is shared by members of the LSDD team, where I have particular responsibility for Library Plus (our discovery service) and our A-Z journal holdings list. I also maintain links and authentication for over 60 databases (through our LibGuides A-Z list). In this aspect of my role, I liaise with members of the ITS (Information Technology Services) team to keep things running smoothly. My previous work as Company Librarian for a small enterprise company gave me an insight into the e-resources cycle and setting up serial subscriptions from scratch. In starting my new position at Derby, I went from administering 15 titles to nearly 8,000! The first thing I check is our shared team inbox for e-resources queries, and answer what I can. The bulk of the enquiries come from our students and include problems accessing a journal title and a journal platform, report of missing/broken content and a request for help about inaccurate holdings information. 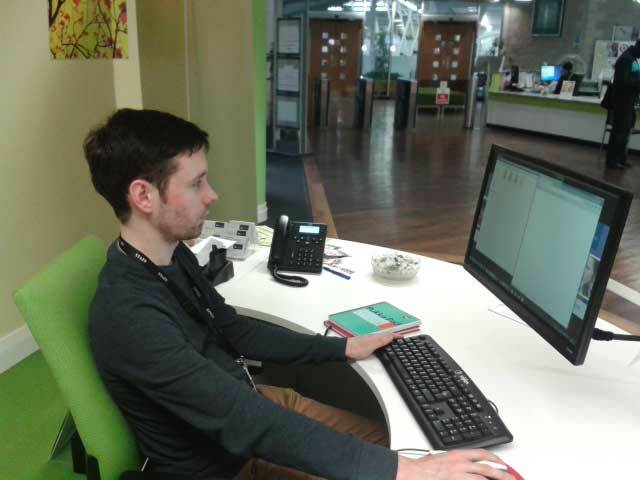 We also regularly receive costing or quotation enquiries from our subject librarians, usually for new resources, and sometimes enquiries from academic staff. The mailbox is also the primary contact point for suppliers, particularly for invoicing and financial queries. I next take the opportunity to check my calendar and attend to any urgent business. Then I begin to prepare my contributions for our monthly LSDD team meeting, where there is the opportunity to talk through the areas we oversee and report on progress. I currently line manage a team of four who each have responsibility for particular areas (inter-library loans, print and e-journals, usage statistics and online reading lists). As the line manager for the team, it’s important for me to check in regularly with them, as a unit and also individually through one-to-one catch-ups, to be aware of any developments and to support and champion them in their work. Following the meeting, a hot drink is required and this involves a trip to Blends (our independent coffee house), whose popularity has exceeded expectations among staff and students alike. This is also a great place to bring visitors! A typical day certainly involves some communication with a supplier, and today is no exception. I’ve arranged a catch-up meeting with our subscription agents later to discuss the progress of our annual renewals and to enable them to brief us with the latest developments from a user perspective. I especially value the face-to-face meetings; they give me an opportunity to get to know the suppliers better, and vice versa. I’m involved in another meeting before lunch, though, this time with our business partner in the Finance Department, to review our serials and e-resources budgets and monitor our progress through the financial year. At the beginning of each month, I update two comprehensive spreadsheets for serials and e-resources, working with our E-Resources Assistant to cross-check invoice payments against expected totals, college allocations, our library management system and the university’s financial system. It is a time-consuming task but it is absolutely vital to ensure that spend is accurately monitored and the monthly figures are correct. Over the past year I’ve been working to improve the presentation of this information to colleagues, particularly at senior management level. Lunchtime – a chance to go and unwind with the newspaper, a Sudoku puzzle and today’s choice from a good selection of eating options on campus, where there’s always something new to try. The campus is directly opposite Markeaton Park, so there’s the opportunity to take a pleasant stroll should I fancy it, though I give it a miss this time as it has started to rain heavily! Starting a shift on the Subject Information Point. The afternoon brings a change of scenery as I arrive to do my stint at the library’s SIP (Subject Information Point) – one of the first points of contact for students. Here we deal with everything from the basic (‘Where can I find the books?’) to the fiendishly complex (‘Can you help me with a literature search on…?’). Every day brings a different query, an opportunity to develop my skills and, above all, a vital insight into how students use and perceive our services. In between enquiries on the SIP, I have the opportunity to catch up on non-urgent e-mails, minutes from key meetings and write up my team report for the next senior managers’ meeting. I also have an opportunity to browse the JiscMail E-Resources list – an excellent source of shared knowledge and support for colleagues in similar roles to myself. With the SIP stint over, I return to the office to continue work on an ongoing library project focusing on evidence-based decision making in collection management. One important aspect of the project is the organization and storage of e-resources and serials information, and I’m currently working with our Copyright Officer to create an accessible database or ‘matrix’ for library staff containing supplier details, renewal dates, costings and licensing issues. Another priority is usage harvesting and how we can use this data to provide context in our decision making for subscription renewals. I liaise regularly with our E-Resources Administrator to identify where there are gaps in usage for particular serials or databases. An evidence-based focus will help to identify different factors which influence the decision-making process for library resources, and enable the library to manage and develop its collections and services more effectively. This year, I’ve had opportunities to present this aspect of our work at the UKSG 2015 Conference in Glasgow and the Bodleian Libraries Anybook Oxford Librarians Conference 2015 with my colleague Paul Cavanagh. Both presentations were well received and have led to further meetings with other libraries to disseminate and share best practice. 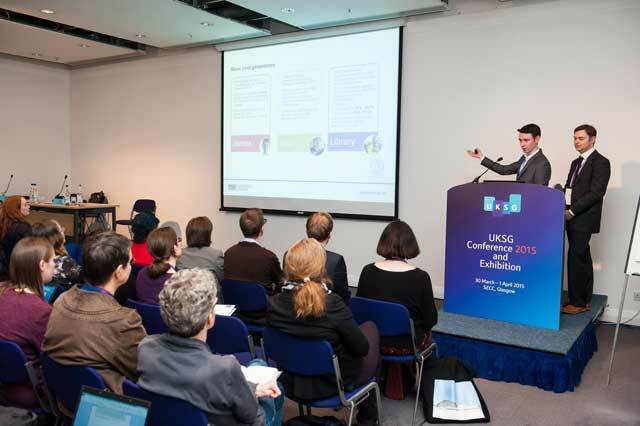 James presenting with colleague Paul Cavanagh at the UKSG Conference 2015 in Glasgow. Suddenly, the working day has come to an end, and it’s time to pack up and leave the office for another day. When I arrive back home, I will unwind with a bit of guitar playing, some reading or catching up with the day’s news. Then to bed, and back again tomorrow for a new challenge!